Weather Network map shows the areas that will be hit by the incoming storm. 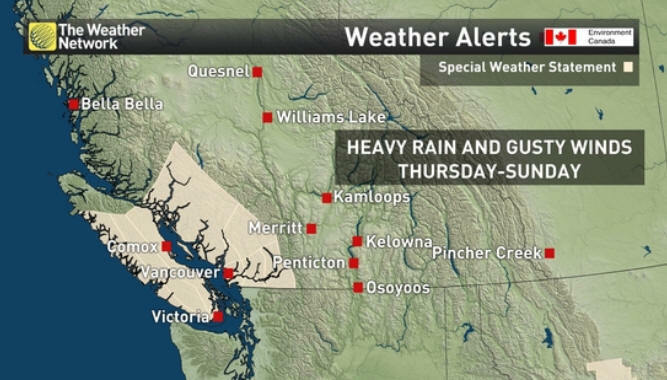 nsurance Bureau of Canada (IBC) is encouraging British Columbians living in the south coastal area to prepare for strong winds and heavy rains due to arrive Wednesday night. Environment Canada has issued a special weather statement for much of the region and rainfalls upwards of 200mm are forecasted. "Storms such as this can have a huge impact on families and communities," said Bill Adams, Vice-President, Western and Pacific, IBC. "That's why we want to help make sure that British Columbians are prepared for when bad weather strikes. If you have any questions, contact your insurance representative or call IBC's Consumer Information Centre at 1‑844‑2ask-IBC. We're here to help." • Store valuable items in upper floors of your home, away from the basement. • If flooding is imminent, shut off electricity to areas of the home that may be affected. Use sand bags or install flood shields or built-up barriers for basement windows and doors. • Create an emergency preparedness plan with your family. • Assemble an emergency supply kit. • Prepare a detailed home inventory. • Pay attention to local authorities and monitor weather developments regularly. When severe weather occurs, it is important for consumers to understand their insurance policies and to know what is covered. If damage occurs, IBC is here to help policyholders if they have any insurance –related questions. • When safe to do so, assess and document damage. • Call your insurance representative and/or company to report damage or losses. • Be as detailed as possible when providing information. • If you need help getting in touch with your insurer, contact IBC's Consumer Information Centre at 1-844-2ASK-IBC (1-844-227-5422).